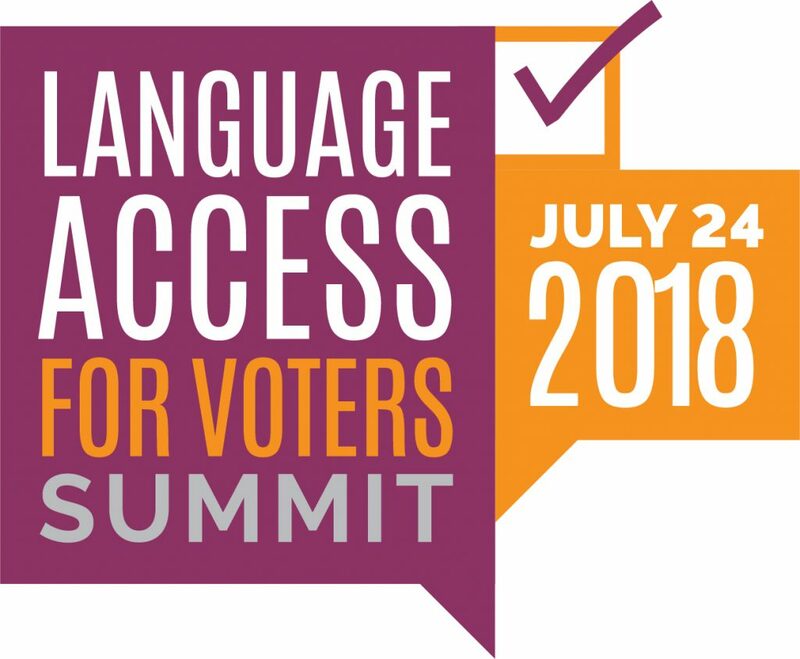 The U.S. Election Assistance Commission, Arizona State University Pastor Center for Politics and Public Service, and Democracy Fund Voice are hosting the third annual Language Access for Voters Summit at the Newseum’s Knight Conference Center on Tuesday, July 24, 2018, in Washington, DC. As in years past, the event convenes state and local election officials, advocates and stakeholders from language communities to discuss critical issues of language accessibility. Speakers will share experiences and observations on efforts to serve voters with language needs. Panelists representing Asian American, Latino, American Indian, Alaskan Native, and additional language communities from across the country will discuss demographic changes, the Section 203 designation process, federal requirements under the Voting Rights Act, voluntary and proactive language assistance, as well as strategies for cost-effective services. Participants will also highlight how emerging trends in election administration, such as the spread of vote centers and new election technologies, are impacting language access. The summit aims to share information, as well as generate new understanding and appreciation between various stakeholder communities. The 2018 elections are the first federal general elections since the most recent Section 203 determinations. This opening session will help set the stage for the day’s discussion, focusing on best practices, and practical tools for serving language minority voters for implementing Section 203 and beyond. Panelists will discuss demographic shifts and their impact for serving language needs across the nation, as well as current issues faced by covered jurisdictions and those who are close to coverage. Effectively providing language assistance requires an investment in resources and time. Additionally, jurisdictions must be fiscally responsible and efficient with their spending. Small and medium-sized jurisdictions with limited resources, as well as jurisdictions covered for multiple languages, face particular challenges in this regard. This session will focus on cost-effective ways to provide language assistance, from small to big ideas. Section 203 has fostered language assistance for many language minority voters over the last 40 plus years. However, as effective as it has been, Section 203 is limited to specific jurisdictions that meet the thresholds. Election stakeholders have used multiple tools to go beyond Section 203 in serving their language minority voters, including voluntary language assistance to meet a community need, effective implementation of Section 208, utilization of Section 4(e) for Puerto Rican voters, and enacting state laws to expand the franchise for language minority voters. This session will explore these and other efforts to ensure that all language minority voters are able to access needed assistance and cast a meaningful vote. The field of election administration is constantly changing. Recent shifts include growing alternatives to traditional precinct-based voting (e.g. vote-by-mail, early voting, vote centers) and increased focus on election technology and the auditability of voting systems. This session will look at these trends and others through the lens of language access and explore how to anticipate and meet the needs of language minority voters when considering changes to election policy or practice. Our last summit session aims to take the discussion beyond the importance of Section 203 compliance towards expanded approaches to language assistance. Kudos to the EAC, ASU, and Democracy Fund Voice for organizing the Summit; this looks like an amazing event with many of the smartest people in the field – and if you are in the DC area, there are few places with a better view of the city than the Newseum! To register, click here … and if you can’t make it the sessions will be webcast. 2 Comments on "EAC/ASU Language Access for Voters Summit July 24"
Tomorow is 24, let’s vote for a better administration. Cool, I love to play plants vs zombies online.